Characters: 5 John Green didn't produce characters here with mixes of traits and tropes to execute a story, he wrote people. People who feel like real, living, breathing people, and that makes all the difference in books. 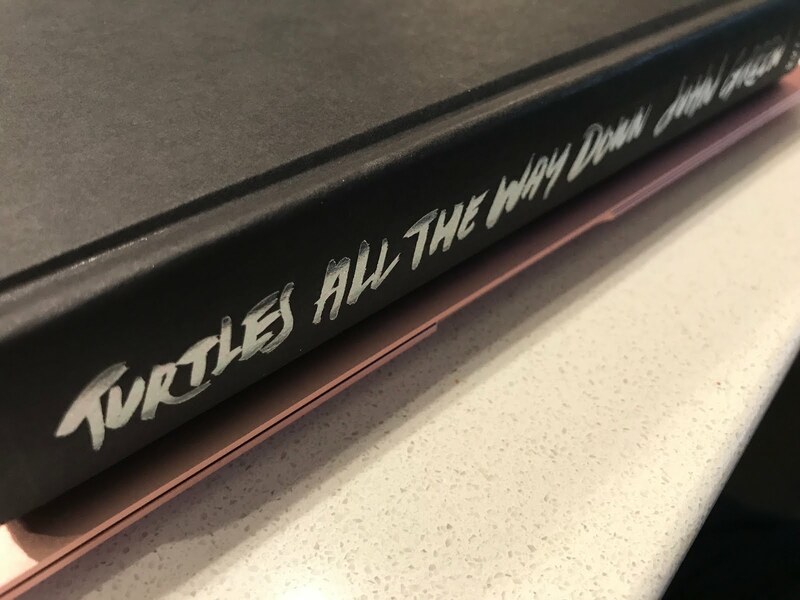 In Turtles, he departs from his usual tendency to write loud, larger than life characters (though that is not to say I didn't adored/appreciate Alaska or Margo). Instead, he focuses on Aza, the narrator, Daisy, her best friend, and Davis, the missing billionaire's son. Aza sees the world the only way she's ever known, through glimpses in breaks of the spirals. She's constantly fighting them and the compulsions they bring. They absorb energy and focus and her ability to live her life. This is something John has shared many times he has personal experience with, as have I. I don't believe I've ever felt closer to a character than I did to Aza. Then there's Daisy who always means well, but she doesn't live in Aza's head or understand the difficulty Aza faces every day, and sometimes she gets fed up with her friend for sometimes not being the most present or inquisitive. And Davis who feels a connection with Aza in that they have both lost people. He takes a strong refuge in the idea of the past, and Aza is something from it, familiar and understanding. Where issues arise with him is when Aza can't get past the intrusive thoughts she has very time they kiss about all the mycobacteria they exchange, and he can't understand that he really isn't doing anything wrong. He's always asking Aza if she's "getting better", and he can't understand that it is a much more complex situation than it appears to an outsider. Plot: 5 While this is very much a character piece where we dive into and understand Aza, John has created an interesting plot to tell the story. Daisy and Aza meet Davis because they're looking into the investigation of his father after the billionaire went missing the night before police raided his home. While the question of where his father is is present, the story's point isn't to be a mystery in that respect. The girls push forward and look for clues on the investigation as much as Aza investigates people as she looks to see what makes them the way they are. Writing: 5 I've always been a major fan of Green's for his writing style for two reasons that both tie back to: he respects his readers. Green uses complex sentence structure and vocabulary. Some critique him, saying that this is unrealistic, but it has always made me feel valued and represented in books. Teens can be eloquent too. Also, Green doesn't ever shy away from major questions about the universe. Why we're here. Why we die. How we live. And how the world works. He shares these musings so poetically as well. I've always felt comforted hearing views on thoughts I often have expressed. I also have to say that this is especially true to this book. Green writes about thought spirals and what that feels like, an experience I know too well. His descriptions of getting strangled by the unproductive thoughts and what comes from that made me want to scream "Yes!" like someone finally understands. While this spoke to my experience deeply, you don't have to suffer from anxiety to feel and understand this book. Green does a great job of putting the reader as deep in Aza's head as she is, which makes it as important for people to read and understand as to feel comforted.